Last week I said there were two movies that actually scared me when I was a kid. John Carpenter's Halloween was the other one, and quite appropriate to today's auspicious date! This is another movie that doesn't try to include any social commentary; there are no hidden messages or agendas here. The plot is simpicity itself. Fifteen years ago in a small midwestern town, a young boy, for reasons that are not explained in the film (more about that below) kills his sister with a large knife on Halloween night, seemingly without any sort of emotion. Fifteen years later, having been incarcerated in a maximum security psychiatric hospital, he escapes, and his psychiatrist (Dr. Loomis, played by Donald Pleasance) goes on the trail, trying to catch Michael while at the same time trying to convince the authorities just how dangerous he is. 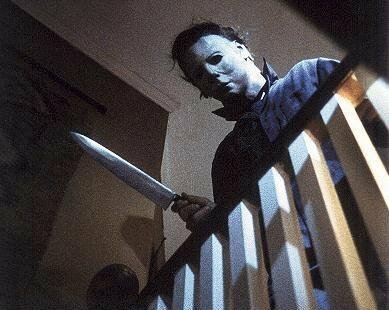 Michael, clad in anonymous blue coveralls and wearing a creepy blank mask, stalks the local teenagers and then goes on a killing spree while they are babysitting in various houses on Halloween night. As he tries to kill the last girl (Laurie, played by Jamie Lee Curtis in her first real acting role), Dr. Loomis finally catches up to him, puts a large number of bullets in him, and Laurie is ambulanced off to safety. The camera then turns back to where Michael's body fell... and it is no longer there. There are a lot of things that make this one of the "perfect" horror films. 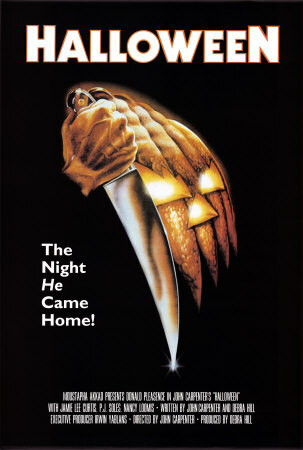 The music, composed by John Carpenter as a money-saving feature because of the film's miniscule budget, is instantly memorable, sets the tension in the film to maximum, and yet doesn't seem to get in the way of the film itself. The low budget led to decisions that were originally made in the interests of cost-cutting, but in the end turned out to be just right for the artistic feel of the film. Notably, the lack of extras on the streets. While the three babysitters are walking to and from school, the streets are empty, adding subliminally to the feeling that they are already cut off from the rest of the world, and thus vulnerable. Most of the film is entirely mundane. We see them walking down the street, talking like any teens would talk, and yet we know that there's a killer stalking them. The music is always there in the background, ratcheting up the tension, and we are just waiting, waiting for the Bad Things to start happening. But what really makes this film is Michael Myers himself. He's a cipher, clad in coveralls and with a mask (the creepy blank face mask was, famously, a William Shatner mask from a local hardware store). He has no motive. He is just pure evil, killing for the sake of it. He has infininte patience, seemingly fooling all of the other doctors by pretending to be completely unresponsive for a decade and a half, just awaiting his opportunity to escape and go on a rampage. He drives himself forward through sheer force of will; he's not some musclebound superman, but just an ordinary mortal who is simply so driven in his mission to kill that he overcomes being stabbed, shot, tossed off roofs, and more. This is a vital aspect of the films that I think is lost in the later sequels (where some sort of supernatural demonic-possession story is glossed onto the backstory) and in the recent remake (where Michael is presented as a very muscular and imposing physical figure). And one of the most extraordinary things about this film is that is accomplishes its goals with almost no gore. No copious amounts of blood are needed. This film presents a perfectly reasonable mundane portrait of middle America and then puts in a mundane, non-supernatural peril. And the resulting suspense makes this a perfect horror film.